Four months ago. 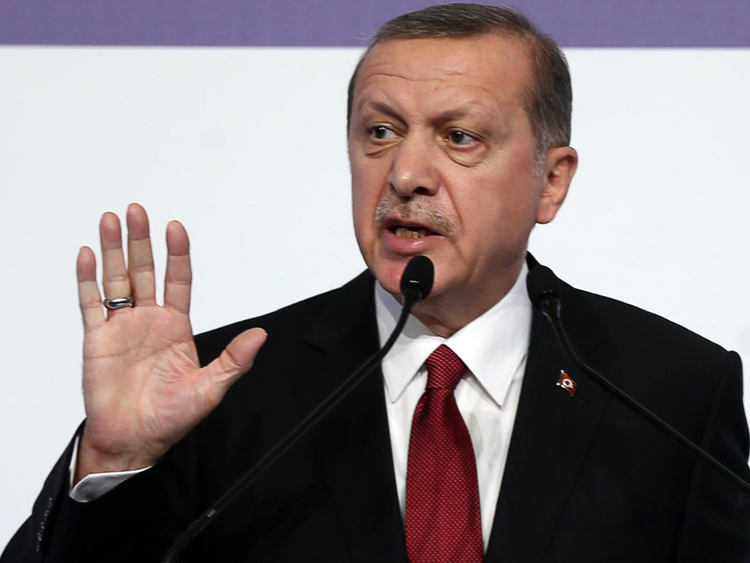 Turkish President Recep Tayyip Erdogan had promised that he would liberate the Syrian city of Idlib from all terrorists groups by no later than October 2018. That agreement, reached at the Red Sea resort of Sochi, was hailed back then as a major breakthrough, sparring the city from more bloodshed, and Europe, from more refugees. The original deadline passed, however, and was extended. Still, nothing happened. On the contrary, the very same group that Erdogan had promised to destroy — Hayat Tahrir Al Sham (HTS) — managed to overrun what remained of his proxies in Idlib, expelling them to the countryside of Aleppo since early this month. By mid-January, reinforcements were being shipped from Damascus to the vicinity of Idlib, threatening to carry out what Erdogan had failed to deliver. If they do that, all of what the world feared will happen in the war-torn city in the Syrian northwest. A big battle will take place, and thousands of refugees will flee, either to Turkey or to the shores of Europe. Very surprisingly, Erdogan has neither objected to government troop advances nor has his Russian counterpart Vladimir Putin. It was their joint signature that saved Idlib from war last October and it will be their joint action that will trigger a showdown in Idlib before next spring. The two men realise that Erdogan bit off more than what he could chew on Idlib, and that he simply lost interest in the city, despite it being on his wishlist since 2015. Originally, Erdogan hoped to create a huge buffer zone deep within Syrian territory, including Idlib and other cities like Manbij, west of the Euphrates, and Al Raqqa, former capital of Daesh in Syria. He soon realised, however, that was technically impossible — mainly, because his partner, Putin, will not allow it. Al Raqqa was taken by the Kurds in 2017 and so was Manbij and then it was handed over to the Syrians last December. The limits of Turkey’s buffer zone, in as much as what Russia will allow, seems to be the cities that he occupied in 2016, being Jarablus, Azaz and Al Bab, with current plans to expand it and include Ras Al Ayn, Kobani, and Tel Rifaat. He hopes to dismantle Kurdish presence along the borderline and carve out an entire area that would be immune to any Kurdish rebound, where he can eventually relocate thousands of Syrian refugees who have been living in Turkey since 2011. Idlib can neither be connected to this buffer zone nor can it serve as a separate Turkish protectorate, deep within Russia’s sphere of influence. Many wondered what Putin had in store for Idlib, as he transformed the city into a hub for global terrorists shipped to it from all four corners of Syria. He had originally wanted to create in Idlib a prototype for what he had envisioned Syrian cities should look like if ruled by the armed opposition. He wanted a state that would radicalise and send shivers down the spine of the international community, making the Daesh-example in Al Raqqa look civilised. In 2016, the Russians looked the other way as Erdogan’s proxies rumbled across the borderline, overrunning three major Syrian cities, and last February, they took the Kurdish city of Afrin. In exchange for letting him get just that, Erdogan did not lift a finger to protect his proxies either in Aleppo or East Ghouta, who were defeated by the Russian and Syrian armies in December 2016 and February 2018. He will likely do the same in Idlib in 2019. Putin is once again looking elsewhere as Erdogan braces himself for another battle, this time against the Kurds in Kobani and Ras Al Ayn. This is where his ambition has to stop, say the Russians, and in exchange for letting him advance against the Kurds, he is expected to surrender not only Idlib, but neighbouring towns and cities like Maaret Al Nouman, Jisr Al Shughour and Khan Sheukhoun. Erdogan is a maverick politician with an ambition that knows no bounds. He is also a realistic statesman, however, who knows exactly when to adjust — and how. His original plan, of course, was to topple the regime in Damascus and replace it with allies in the Muslim Brotherhood. When that failed, he tried snatching Aleppo, but that too was obstructed by the Russian intervention of 2015. Now he seems to have abandoned Idlib as well, seeing the Kurdish pockets as far more dangerous — to his country’s national security — than anything else in the Syrian battlefield. The two groups that were recently shipped out of Idlib, Ahrar Al Sham and the Zinki Brigade, were seemingly brought out of harm’s way, rather than defeated by HTS. Erdogan needed them elsewhere, for another battle — not against HTS but against the Kurds. Sami Moubayed is a Syrian historian and former Carnegie scholar. He is also the author of Under the Black Flag: At the frontier of the New Jihad.